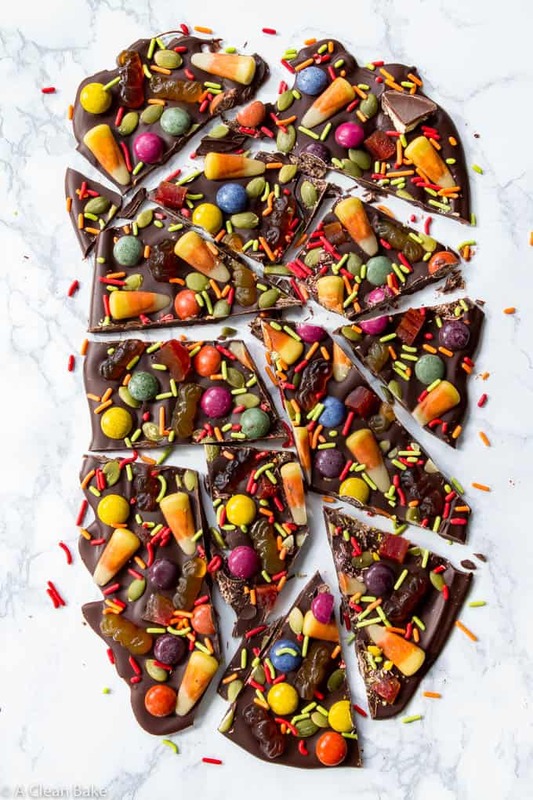 Halloween bark is just a fancy name for a slab of melted dark chocolate studded with a variety of Halloween candies, plus some dried fruit and nuts for good measure. 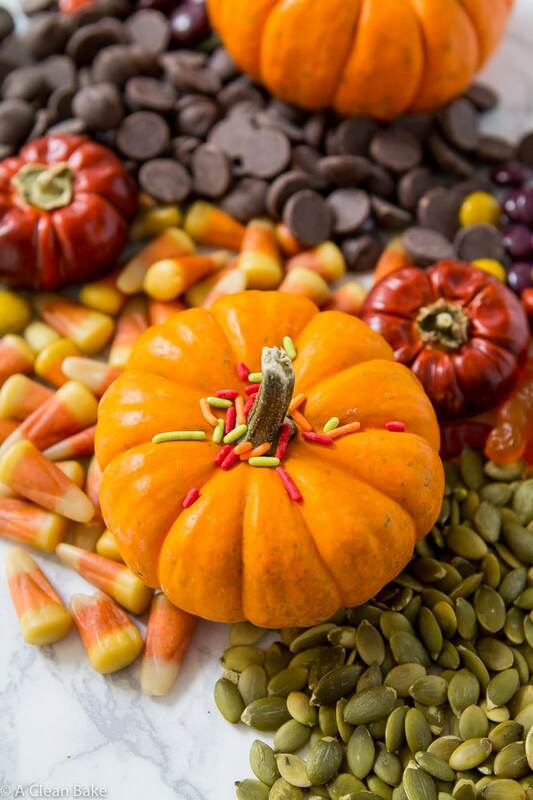 Halloween is probably the one day of the year when eating candy-covered candy is acceptable – so live it up! Oh, hi! It’s me, your favorite disappearing blogger. I had a couple more recipes planned for next week but Baby Bake got sick, and developed a high fever that just wouldn’t quit. It was exhausting and kind of scary (to the doctor who casually told me “I wouldn’t be surprised if it spiked to 104 tonight”, this is my reaction –> 🙅 ) and there were a lot of nights where we were not sure if we’d have to go to the ER. Luckily, we didn’t have to (thanks, Ibuprofen!) but blogging still kind of took a backseat. I’m sorry! 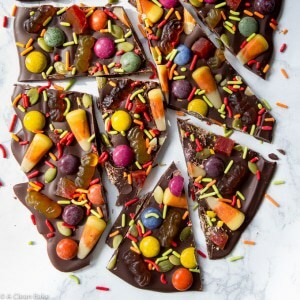 Thankfully, he is on the mend – just in time for Halloween, and for this candy-overloaded Halloween bark! 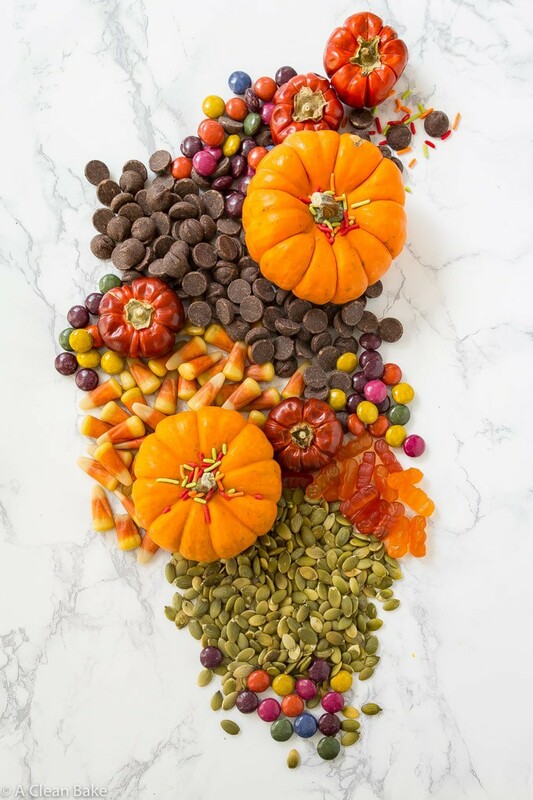 Wait – is there such a thing as candy overloaded on Halloween? I’m realistic in my understanding that I can’t keep him away from sugar forever (though I can damn well try! ), but you’d better believe that when he does have sweets, at least at home, they’re going to be as not-terrible for him as possible. Which brings me to the reason that the candy in this halloween bark looks a little different. Call it research, or practice, or just an excuse to play with new kinds of ingredients, but I sought out only better (remember: it’s all relative) ingredients for this candy bark. A base of dark chocolate. You can use chips or a chopped up bar, since it all gets melted into a slab anyway. Naturally-dyed candy and sprinkles! You can get everything at Whole Foods, which carries a surprisingly large selection of candy (who knew?). The brands I used in this bark are Yum Earth (for the candy corn and gummy bats) and Unreal (for the “chocolate gems” aka Not-M&Ms). This is not sponsored, by the way. I just found these two brands and liked them both. Surf Sweets also makes great less-bad-for-you candy, and Annies had some themed gummies (which I’ve never tried, so I can’t comment on). Raw, unsalted pumpkin seeds. Lame? Maybe. Theme-appropriate? Totally! Anything that helps stabilize your blood sugar after a bite of this stuff? ABSOLUTELY. 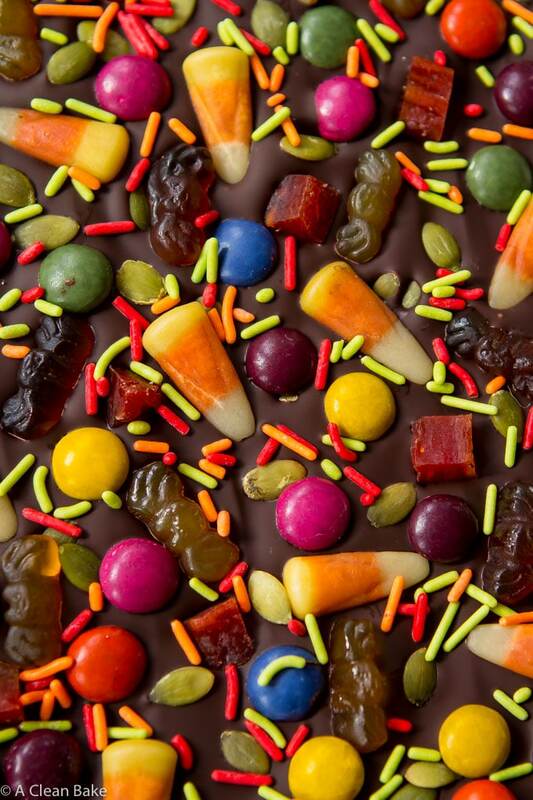 Let’s be real: this stuff is like 93.6% sugar and, while that is not even close to an accurate number, the point is that this halloween bark is 100% a treat. But Halloween is just one day out of every 365, and ever since the year I was maybe 12, when my parents swallowed their disgust and commitment to forcing proper nutrition and lifelong health on their children (monsters!) and allowed us to have sheet pan nachos for dinner, with a base of Cool Ranch Doritos – to this day, one of the best meals of my life (you had to be there, or just be me, aged 12) – I have considered Halloween to be the one evening of the year when, just maybe, we should look the other way on a few things and let the kids have some candy-covered candy to wash down their Dorito-based dinner. 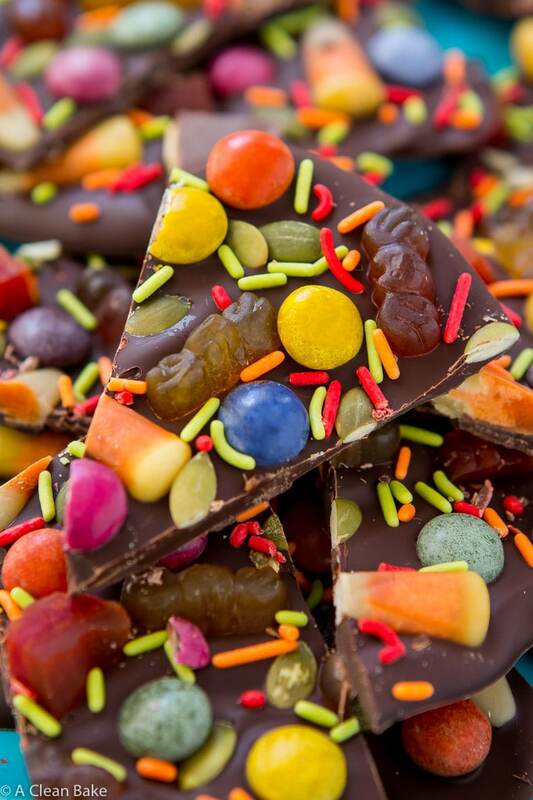 Halloween bark is just a fancy name for a slab of melted dark chocolate studded with a variety of Halloween candies, plus some dried fruit and nuts. Line a baking sheet with a piece of parchment paper or a nonstick pad, and set aside. In a heatproof bowl, melt the chocolate in the microwave in 30 second increments (stirring in between), until smooth. Pour the chocolate onto the prepared pan and spread into an even layer. Sprinkle the remaining ingredients over the melted chocolate, pressing very gently to make sure they adhere. 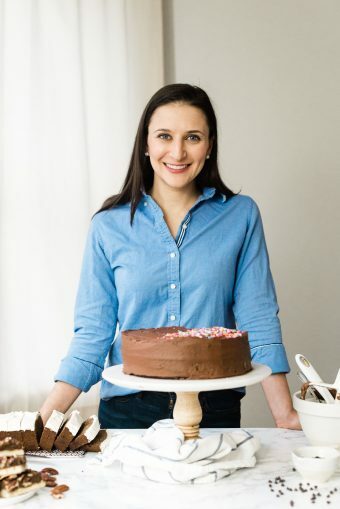 Let the chocolate come to room temperature, then refrigerate until fully chilled before chopping into pieces. Store leftovers in an airtight container in the refrigerator for up to 24 hours. Best Halloween treat in the world! Way better than all the commercial candy I could ever buy.